See the Sunflower in yourself! The poem ‘The Sunflower’ I wrote after I started painting the accompanied painting. The reason I started painting is because I wanted to try to show what God was showing me through my dreams and visions. For a couple of years I had been following the story of Akiane Kramarik and one day in December of 2015, I wondered if perhaps I could do the same. Don’t get me wrong, I could never paint as good as she does. She is a true genius in painting. But as a hobby I just wanted to try it out. My oldest brother paints as well and my father loves it too, so it kind of runs in the family also. After getting my equipment together I decided to start by trying to paint apple blossoms. As I was setting everything up, God gave me a vision, a quick snapshot, of a sunflower. Feeling God’s request of me painting a sunflower instead, I started painting ‘The Sunflower’. It took me several months to figure this whole painting thing out but God supported me by bringing Sunflowers on my path wherever I went. The sunflowers even surprised me in Austria where I was on holiday! During this time God quoted this poem for me and it is a poem that is still close to my heart. Whenever I feel like giving up on my assignment from Jesus to write a book, I read this poem to bring me back. Or when I feel insecure and a failure, I read it to lift up my spirit. What this poem does is show me that I need to learn to see myself through the eyes of the Father. Which is something I do too little. I often look at what I have achieved so far, how many people have read my poetry, my blogs, my writings, I compare myself too much by the standards of this world and too little by the standards of Heaven. In God’s eyes I am unique and beautiful. I have a purpose that I have to focus on regardless of the lies satan tries to put in my head. So whenever life brings me down, I read this to put me back on my feet with my eyes firmly planted on my journey ahead. And I hope that it will do the same for you!!! 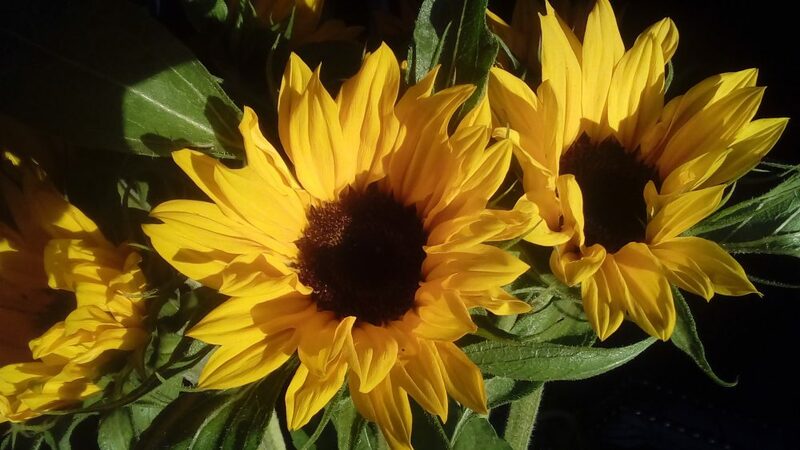 I hope that when you read this poem, you will plant God’s words deep in your heart, “I see the sunflower in you, all I ask, is for you to see it too”! By the way, the sunflower is a flower that grows towards the light of the sun. Just like the sunflower you may grow towards the light of your Savior Jesus Christ. Seek His light to brighten you darkness and know that Jesus loves you more than you can ever comprehend! This is my painting called ‘The Sunflower’. to bear fruit for the next harvest. if it does not first die in the ground? after the most adventurous quests. but I tell you that the heart is against Me. The ears don’t listen and the mouth does not speak. Unreachable is the human soul. will bear many fruit during the harvest. but I tell you that time is an earthly measure. but the seedlings cannot bear the fruit. and yet I only wait for the petals to unfold. when everything happens according to My plan? when I have set you apart from the rest? I tell you, My light has been around you all this time. Open your unique, golden petals. and your harvest shall be great. will be filled with pure joy. This entry was posted in Geen categorie and tagged Christ, Jesus, Love, poetry by Gineke van Keulen. Bookmark the permalink.